#58. The Wasatch Mountains with Salt Lake City and Great Salt Lake. 21 x 44, oil on canvas. "Gilbert Munger 1877" lower left. The picture shows Salt Lake City with the Wasatch Mountains behind as viewed across the Great Salt Lake from Antelope Island. 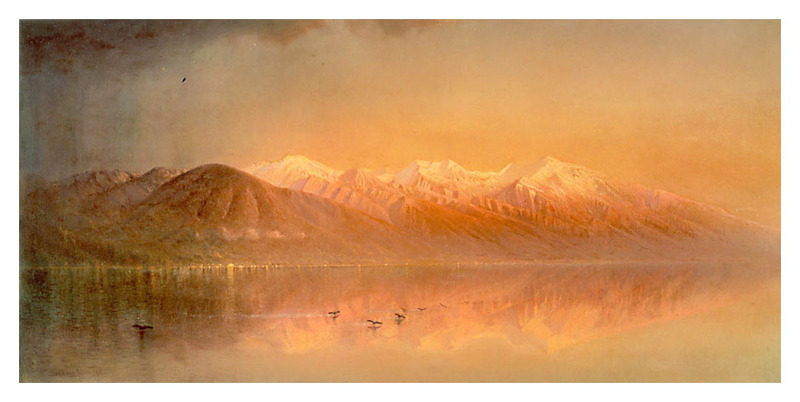 (See the discussion of the Wasatch paintings here for more details.) This appears to be a studio painting from sketch #74 and is similar to #219. The dark area in the upper left is a rain shower. Owned by the geologist Clarence King, who probably obtained it directly from the artist. Offered at the auction of King's estate on March 12, 1903 as lot 98: "Sunset". The written description, size, and signature from that catalog item matches the Utah Museum painting exactly. From the Sporting Gallery in Middleberg, VA, via Chicago map dealer Kenneth Nebenzahl in 1977 to the permanent collection of the Utah Museum of Fine Arts (Acc. 1977.022), Salt Lake City. IAP 53320007 & 80040594. See "Gilbert Munger: On the Trail" by Cummings, in Bulletin 1982,10, Benton Museum of Art, Univ. of Connecticut, Storrs, p. 15; and "Luminist Paintings in California," by Harrison, in The Magazine Antiques, CLX, 5, (Nov 2001), p.670-679. Image from Utah Museum of Fine Arts photo.